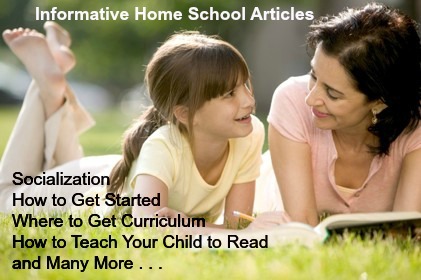 I hope you enjoy these home school articles that I have collected for you! Schools are from Mars, Homeschoolers are from Earth - Here's an interesting perspective from a homeschool Dad about the different philosophies between public and home schooling. 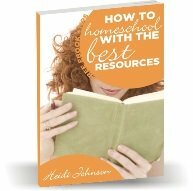 Where to Get Homeschool Curriculum - Here's an article I wrote about where to find homeschool books and resources. Homeschooling and House Cleaning - Is it possible to homeschool and have a reasonably clean house? Here are some tips to help you accomplish all you need to do. Homeschooling - Where to Start - Starting out in home schooling can be overwhelming, but it doesn’t need to be that way. Discover some simple tips you can use to begin this journey knowing exactly what you need. Homeschoolers and Socialization Opportunities - Many people think that homeschoolers are unsocialized. Are you new to homeschooling and think that your children won't get the socialization they need? Or maybe you're a veteran homeschooler and want some help in convincing people that homeschoolers get plenty of socialization opportunities. Click on this article and see all the socialization opportunities that I wrote about in this article. Abeka Homeschool Curriculum - What is it and Should I Use it? - Almost everyone that is thinking about homeschooling or has been homeschooling for any length of time has heard of Abeka. This home school article will give you a general idea of what it is and if it might be the right or wrong curriculum for you. Homeschool High School - Pros and Cons from a Veteran Homeschool Mom - This home school article will give you just what the title says. Enjoy! Homeschool Curriculum - This article talks about whether you should or should not use a planned homeschool curriculum. Homeschool Math - How Do I Teach Math and What Should I Use? Homeschooling - Do You Have What it Takes? Home Schooling - Where Do I Start? Home School Methods - What Do Parents Use To Homeschool? Home Schooling - Why Do It? Why Would I Want To Use The Internet For Homeschooling?